Idli – Though this is a very typical South Indian breakfast, it is no longer made only in South Indian homes. Like Dosa, Idli is also world famous 😛 I know couple of my non-Indian friends who make Idli at home!! Well, having said that, most people typically buy the idli batter that is available in stores. I also used to do the same. Afterall, it saves so much time and preparation. That is what I used to think till I made my first perfect batch of Idli batter. The first time I tried making Idli batter, I was soo disappointed. My idli wasn’t fluffy or soft. It was hard and sticky. I realized that my urad dal was the culprit. Please make sure that the urad dal you use for the batter is of good quality and fresh. 1. Soak rice and urad dal for 4-5 hours in separate bowls. Put fenugreek seeds also along with urad dal. 2. In a wet grinder, mixie or blender grind urad dal into a smooth paste using very little water. Use the same water in which you soaked urad dal. 3. Grind rice also into a fine paste. The batter should be very smooth, it should not have grains. 4. Mix ground urad dal batter and rice batter well. Add salt to the batter. 5. Keep the batter in a warm place overnight(or 8-10 hours) for fermenting. During winter it could take longer for fermentation. The batter should rise well or ferment well to get good idli/dosa. 6. Once the batter rises, take the top portion of the fermented batter and use it for making idlis. Keep the remaining batter in the refrigerator. Note: I asked specifically to use the top portion for idli, because, I use the same batter for both idli and dosa. It works perfectly for me. As the batter sits longer, it gets more sourness. Then you could use it for dosa. Do not stir the batter too much once it is fermented. That will prevent the idlis to become soft and fluffy. 2. Grease the idli plates with oil. 3. Using a laddle, pour the idli batter into the moulds. Stack the plates. 4. Once the water boils, lower the idli plates into the steamer and steam it for 7-8 mins. Water – 1/2 cup apprx. 1. Pulse the oats in a blender to coarsely grind it. 2. In a bowl, mix oats, salt and cardamom powder well. Sprinkle water little by little over the oats mix and mix well with hands. When you add water, note the below point. Note: The amount of water added to the oats mix is very important for the puttu to come out well. Extra water would make the puttu very sticky and hard. Less water will not let the puttu to hold together. When you make a ball with the oats mix, the ball should retain its shape. So add only as much water as is required for the oats mix to hold together. The mix should be moist. 3. To make puttu, boil some water in the puttu pot. Meanwhile, layer the puttu kutti(cylindrical shaped mould). Put the perforated disc on the mould and add 1 tbsp grated coconut, then put the oats mix till the puttu kutti is half full. Add another tbsp of grated coconut. 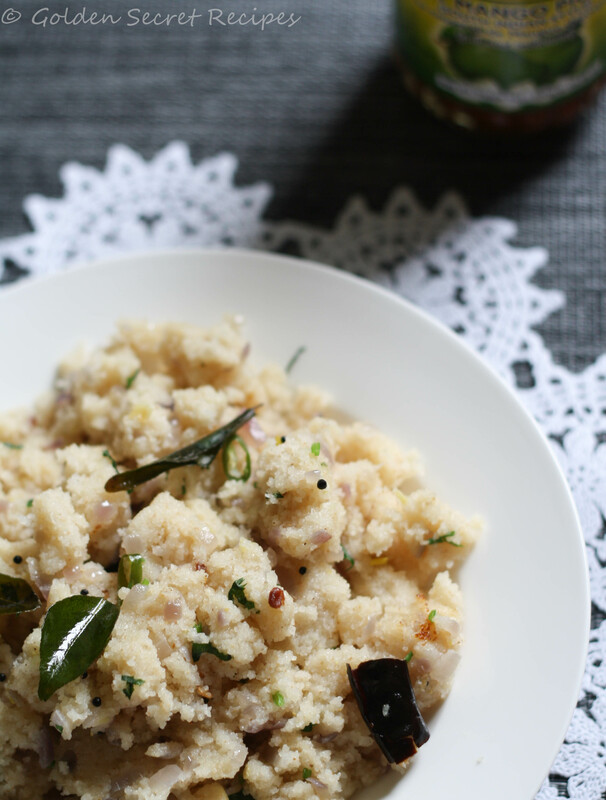 Fill the puttu kutti again with the oats mix. Again put a layer of grated coconut. 4. Close the lid of the puttu mould and fix it on the pot of boiling water. Since the water is already boiling, steam it only for 3-4 minutes. When you see the steam coming out from the lid of the mould, you know that your puttu is ready. 5. Open the lid and slowly slide the puttu onto a plate by pushing it with a skewer or something. Serve with Kadala(Whole Bengal gram) curry or banana. Potato stuffed poori- I had only heard of aloo paratha until recently when my friend mentioned about stuffed poori. She asked me if I have ever made Aloo Poori. Never having heard of it before, I gave her a confused look 😛 Then she explained that just like you make aloo paratha, they make aloo poori in their place. Yesterday I had some leftover Red curry from Banana leaf. I wanted something nice to go with it. I settled for poori. But I realized the curry is too less. So I wanted to make something more filling. I checked my pantry and found potatoes. That’s when I remembered my friend mentioning ‘Potato Stuffed Poori’ and I knew that’s what I am making for dinner. 1. Make the poori dough using the ingredients mentioned under ‘For Poori’ section. Keep it covered and keep aside. 2. Meanwhile, make the filling using the ingredients mentioned under ‘For filling’ section. Start by boiling the potatoes and peeling the skin off. 3. Heat oil in a pan. Add chopped onion, salt, green chilli and ginger garlic paste. Cook till onions turn pink. 4. Add red chilli powder, turmeric powder and garam masala and saute for a minute or so. 5. Add boiled potato and mash it well using a spoon. Mix it well so that the spices spread evenly. 6. Remove from heat and garnish with chopped coriander or green onion and mix well(I used green onion since I had it avaiable). 1. This process is similar to making Aloo paratha. Make lime sized balls with the poori dough. 2. Roll it out a little and put a spoonful of filling in the center of the rolled out dough. 3. Cover the filling from all sides with the sides of dough and roll it out in the shape of a small circle. 4. Repeat the process for the remaining batch of poori dough and filling. 5. Heat oil in a Kadai/deep pan. To check if the oil is hot, drop a small piece of dough to the oil and it should rise to the top immediately. 6. Slowly immerse the rolled out pooris into the oil. Fry both sides till it becomes light brown. 7. Remove the poori from oil and place on kitchen towel to drain extra oil. 8. Repeat the process for all the rolled out pooris. Serve with chicken curry or side dish of your choice. Note: 1. If the oil isn’t heated well, the poori will absorb a lot of oil. So ensure that the oil is hot. 2. Also, don’t make the dough very soft by adding more water. Extra moisture in the dough will also cause poori to absorb more oil while frying. GoldenSecretRecipes has completed one year in the blog world. It has been a great journey thus far and I would like to thank all of you for supporting me, visiting my blog and trying out ‘Golden Secret’ recipes 🙂 I was thinking hard as to, what should be my post on this occasion and what ‘new’ idea can I implement this year. -If your dosa comes out too brittle or dry, probably it is because of Urad dal. It is important that you use good and whole urad dal. I made dosa batter so many times and it would never come good. I tried all possible proportions. But finally when I changed the urad dal, I got the perfect dosa batter!! Also, check the batter consistency. If your batter is too thick, even then the dosa will not come good. – If your dosa batter is not fermenting well, then try adding fenugreek seeds. Fenugreek seeds help in the fermentation of the batter and also gives a nice brown color and texture to the dosa. Also use your hands to mix the batter well. Body temperature helps the fermentation process. – If your batter isn’t fermenting when you keep it overnight, then place the batter inside the conventional oven with the oven light on. Keep the batter uncovered so that it gets the heat from the light. This will help the batter to rise. 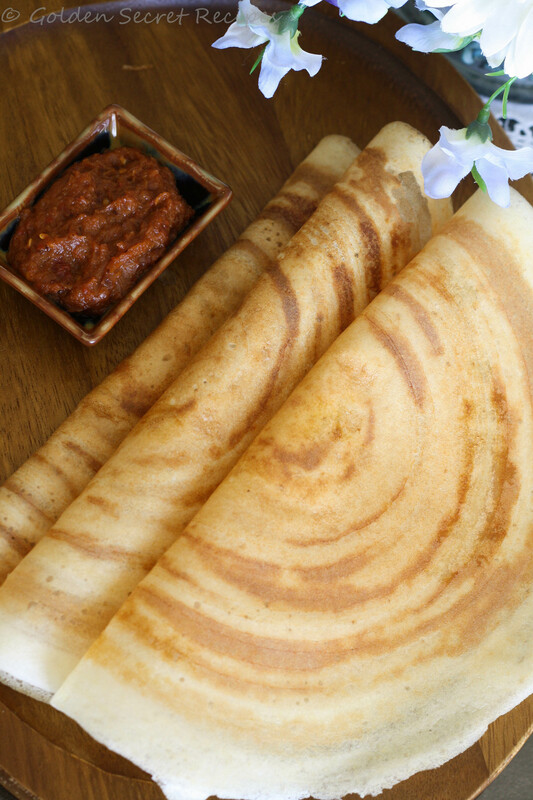 – When you make thin dosas, it is important that the dosa is crisp yet have that right amount of softness. The ratio of rice is what determines that factor. If you use only raw rice, your dosa can get too crisp/ dry. The parboiled rice adds softness to dosa. – If you are not getting crispiness in your dosa, then it is probably because of too much parboiled rice. In that case, decrease the proportion of parboiled rice and increase the amount of raw rice. – Using non-stick griddle helps if you are new to dosa making process. 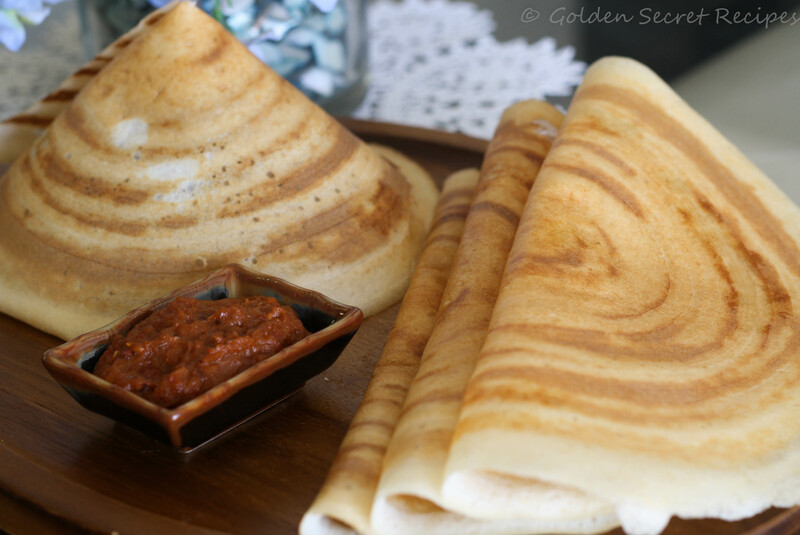 As you make dosas a few times, you will get the speed needed to spread the batter evenly to get thin dosas! Your griddle should be hot before you pour the batter to it. If you drizzle few droplets of water, it should sizzle away immediately. The pan/griddle shouldn’t to overheated also. If yours is not a non-stick pan, you can pour a handful of water to the griddle and cool it down. But if you do the same to your non-stick griddle, it will spoil your griddle(the non-stick coating will come off in a short period). – If your batter is sticking together or forming lumps when you try to spread it, it is due to the pan. Either your pan needs to be greased well or it shouldn’t be! Strangely, I could get rid of this problem by NOT greasing the griddle before pouring the batter. My non-stick griddle is new and so if I grease it with oil, my batter would form lumps and stick together when I try to spread it. – If you are find it difficult to take out the dosa from the pan once its ready or in other words, if your dosa is getting stuck to the pan, one way you can avoid it, is by rubbing some raw onion to the pan before pouring the batter. This gives a non-sticky effect to the pan! Hope you find the tips useful. Also watch this 2-minute video guide for making thin, crisp and PERFECT dosa 🙂 Enjoy! 4. Mix ground urad dal batter and rice batter well. 5. Keep the batter in a warm place overnight(or 8-10 hours) for fermenting. 6. Once the batter rises, add salt to the batter. 7. Heat a flat skillet/non-stick dosa pan. Lightly grease the pan with oil. 8. Pour a ladle of batter onto the center of the pan. Using the ladle, spread the batter in a circular motion spreading it from the center to the sides of the pan. 9. Let dosa cook in medium high flame for about a minute(or lesser). When it starts to turn light brown, pour few drops of oil or ghee. 10. After few seconds, the edges of the dosa will start to come off from the pan(if using a non-stick pan). When the dosa turns brown, fold it over in half or roll it and serve immediately(for the best taste). 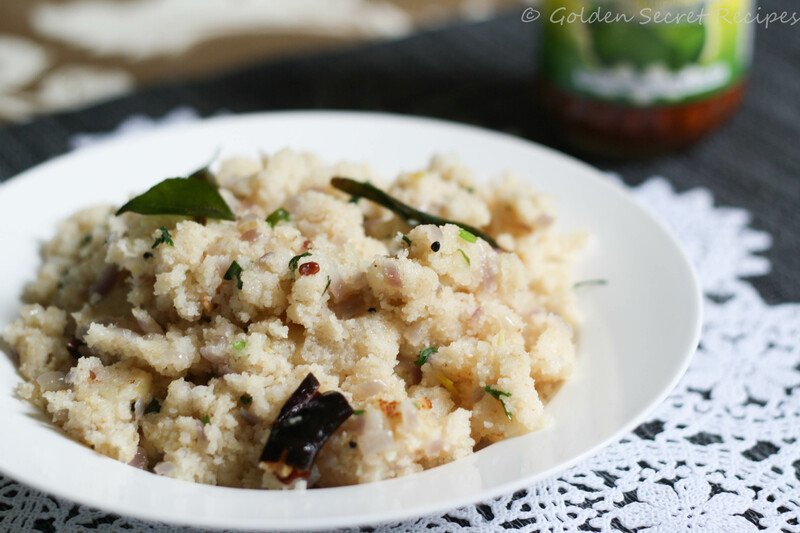 There are many variations of making upma like you could add some veggies to the upma to make it wholesome. But I have included the basic recipe as of now. I took some time to perfect it. Basically, the amount of water and the way you let the rava cook after adding it to the water determines the texture and look of your upma! 1. Heat a pan and roast rava till it turns light brown. Alternatively, you can roast/warm it up in the microwave for 2-3 mins, giving it a stir at half time. Keep aside. 2. Heat oil in a pan and put mustard. Once it splutters, add urad dal. Once the urad dal becomes light brown, add broken dry red chillies and curry leaves. 3. After it splutters, add chopped ginger and green chillies. Saute for few seconds till the raw smell goes off. 4. Add chopped onion and 1/4 tsp salt. Cook in medium high flame and saute occasionally. 5. Once the onions turn pink, add water and remaining salt. 6. Let the water boil. Stirring continuously, add roasted rava slowly. Stirring prevents rava from forming lumps. 7. Ensure that all part of rava absorbs water or is soaked by water. Be careful because the water/rava starts bubbling at this point. 8. Give a good mix and cook covered in medium flame for few mins. 9. When it starts to become dry, keep sauteing. When the rava cooks through, remove from heat and garnish with chopped coriander leaves.